Hillary Clinton returned to her alma mater Friday and delivered a remarkable rebuke, not just to the right-wing policies but to the disdain for truth that is so frequently evidenced by the man she beat by almost 3 million votes in the 2016 presidential election. An attack of unimaginable cruelty on the most vulnerable among us—the youngest, the oldest, the poorest, and hard working people who need a little help to gain or hang on to a decent, middle-class life. It grossly underfunds public education, mental health, and efforts even to combat the opioid epidemic. And in reversing our commitment to fight climate change, it puts the future of our nation and our world at risk. Clinton grounded her denunciation of the Trump agenda in an impassioned defense of American values. Her remarks combined humor, insight, and ardent advocacy for a radically different vision of the the country’s future. Her speech embraced the resistance to the Trump administration and its toxic brew of “alternative facts,” jabs at journalists and dismissals of critical inquiry. At the core of her message was a defense of open and honest debate based in reality rather than White House spin. In the most powerful portion of her speech, Clinton warned that the discourse and, yes, democracy itself, are threatened by an administration that refuses to acknowledge the truth. One does not need to be a Clinton enthusiast to recognize the importance of the speech she delivered at Wellesley. 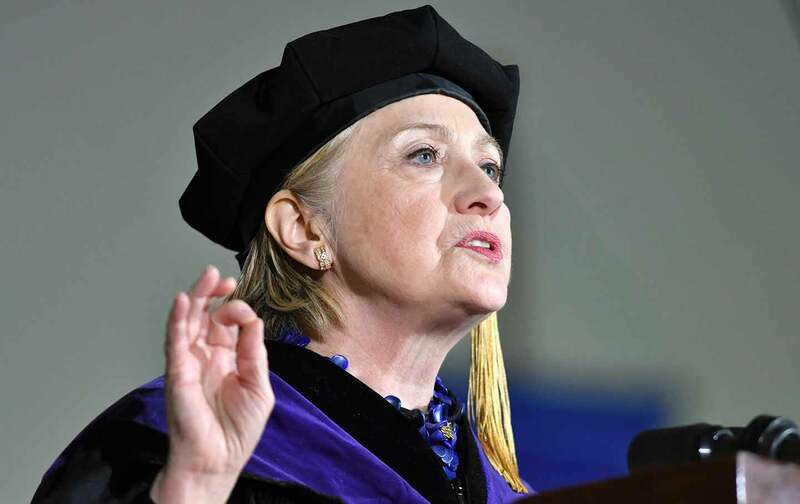 There’s plenty to criticize about her 2016 presidential run—Clinton freely acknowledges that she did not run a perfect campaign—but this was a commencement address, not a campaign speech. It contained within it a necessary argument against complacency at a time when the basic premises of the American experiment are under attack. Clinton used the bully pulpit that is afforded defeated presidential candidates—especially those who prevailed in the popular vote even as they fell short in the Electoral College—to argue against the normalization of Trumpism. Of course, Clinton’s critics will object to her tone. They always do. In particular, Trump enthusiasts will be unsettled by her comparison of the moment in which the Wellesley College Class of 2017 is graduating with the moment in which her own Wellesley College Class of 1969 graduated. “We were furious about the past presidential election of a man whose presidency would eventually end in disgrace with his impeachment for obstruction of justice, after firing the person running the investigation into him at the Department of Justice,” she recalled, with a reference to Richard Nixon that drew roars of approval from a crowd who immediately recognized a historical synchronicity at the close of a month that began with Trump’s firing of FBI director James Comey. While Clinton’s partisan critics will gripe about her tone, their real objection will be to her truth.